Guest accounts on mobile cannot send or receive gifts between the Facebook friends. 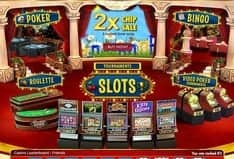 Visit DoubleDown Get 10,000 Free Chips and More Bonuses! Accepted debit and credit cards include MasterCard, Visa and Amex. 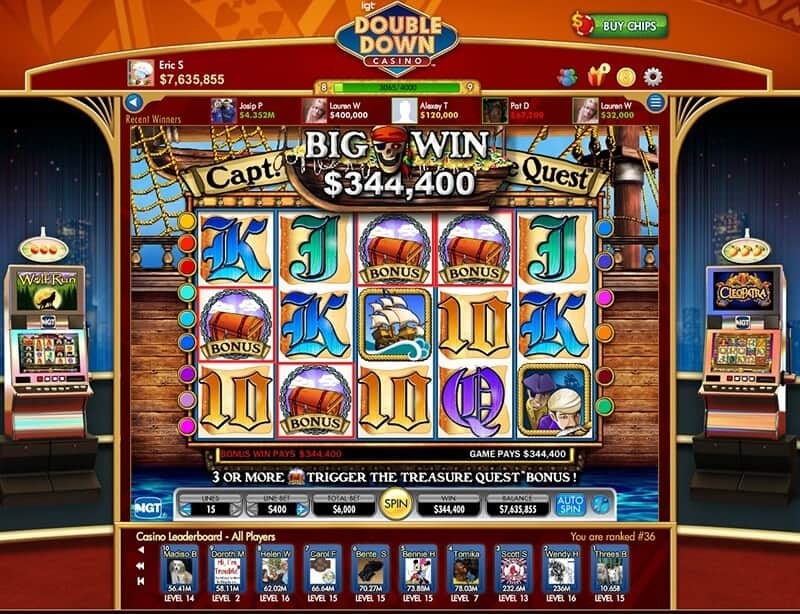 International Game Technology, popularly known by its acronym IGT, acquired DoubleDown the parent company back in 2012, four years after DoubleDown Casino was launched. The social gaming site brings you the best and biggest casino hits in the likes of Hexbreaker 2 and Lobstermania 2, as well as lots of original and unique content. This exceptional social gaming site also comes with brand new slots such as Orange Is the New Black, based on the award-winning television series. Find out more about these and many more details here in the next paragraphs of this DoubleDown Casino online review. Whether you are waiting to catch a train at the subway or waiting in line at the local coffee shop, the DoubleDown Casino social app will have your back. Here, you can access a vast range of casino games such as slots, blackjack, video poker and so much more. And as you play you can share your real-time experience with your Facebook friends and invite them to play as well. 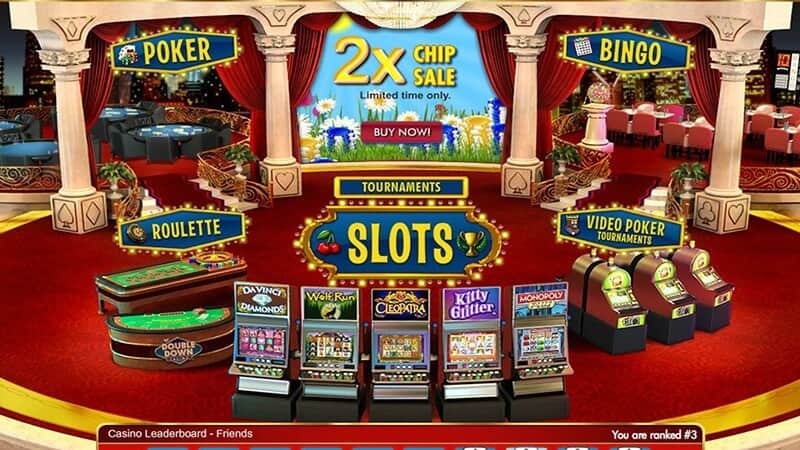 The widest variety of games present on this social gaming site are the free slot machine games. In fact, thanks to IGT, they are basically the same games found at traditional online casinos. You can expect to see Crown of Egypt, Siberian Storm, Bloom and even the Ellen DeGeneres Show™. You have more than 70 options here so you can indulge yourself as much as you wish. Other types of games aren't left out either even though the options aren't as many. The table games section features a lot of popular options like blackjack and roulette and an extra special addition from IGT, 3 Wheel Roulette. The video poker section boasts of more common titles such as Ultimate X Poker and Jacks or Better. Finally, the poker and bingo sections provide you with a lot more interactivity. You will find favorites like Pot Limit Omaha or the ever so popular Texas Hold'em variant. In bingo, you can play manual or auto format, depending on how much engagement you seek with the game. 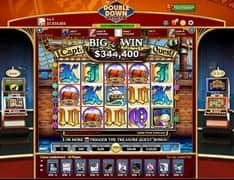 From the brief outline above in this DoubleDown Casino online review, it is not easy to compare it with most of the social gaming apps out there. Our DoubleDown casino mobile review was quite smooth because of the exceptional mobile experience of this social gaming app. It is compatible with all major platforms, so whether you are using Windows, iOS, Android or the BlackBerry operating system, you are good to go. The site responds well to devices of all sizes, whether it's a tablet, a Surface Pro device, or a Microsoft Lumia smartphone. There are also dedicated apps for Android and iOS platforms that can be downloaded for free from the respective stores. So, get your iPhone, Samsung Galaxy, Motorola Moto G, Google Nexus or any other smartphone and tablet you may have, download the social gaming app and have fun. Select the game that you feel you know so that you get the best bang for your buck in case you make real money purchases in the game. Take a few minutes to learn the payouts, mini games and the bonuses in store especially in expert level games such as blackjack and roulette. Slots and bingo on the other hand don't need as much experience. Put more emphasis on your bets. For example in slot games, you can bet on as many lines as you can pay for with your virtual currency. The more the number of lines, the higher your chances of winning. Play smart in any of the games that you choose, especially the table games. With slots on the other hand, you can enjoy as much as you wish and as the reels turn simultaneously, you will definitely feel that tournament atmosphere. DoubleDown casino offers you reliable financial transfer systems with little or no delays at all. You always have the luxury and convenience to make payments using credit cards or debit cards such as MasterCard, Visa and Amex. Mobile wallets such as Skrill and PayPal are also accepted whether you are using the full site or the mobile app. The gaming site offers no real money withdrawals and the winnings are presented to you in virtual currency in your account. The money can be used to redeem more spins and rounds so that you can keep progressing in the game. If you are a player who is looking to make money, you are in the wrong place. DoubleDown offers no real money winnings. All the earnings in this social gaming site are in form of virtual currency. You can only redeem the winnings to get more coins to help you with advancing in the game. During our Double Down review, we realized that it doesn't offer any Live Dealer games. This may be a letdown for some players out there who enjoy the added thrill of facing a live dealer. As a guest player, you will not be able to share or receive gifts from Facebook friends and apart from that you are not able to win gold coins as you play, which is the main purpose of playing. If you switch operating systems like from Android to iOS and vice versa, your progress is lost. That is such a bummer! DoubleDown Casino, just like regular online casinos, offers you bonuses from the moment you create your account. The bonuses are set to increase as you play. Even as a guest player you can still collect free slot bonuses, with no logins or registration required. You will receive $1,000,000 in free chips, which is a form of virtual currency in the game as it is a social gaming app. This will increase your chances to earn more virtual currency as you keep playing. We also found out during our DoubleDown mobile review that there are lots of opportunities of winning jackpots in most of the games available. This is based on the number of Facebook friends you ask to sign up for the game. Here you get $1,000,000 for each friend, this is up to a maximum of 25 friends. Though if any of your Facebook friends decide to uninstall the application, the bonuses are not applicable anymore. You are rewarded for the consecutive number of days you use the online platform. For every subsequent day, up to a maximum of 25 days from the day of signing up, you receive $ 1,000,000 in chips. Have you ever seriously thought about taking a long flight to the Las Vegas strip just to casually join in on the gambling action even though you aren't much of a gambler? If so, then you need not worry anymore. DoubleDown Casino presents you the best of both worlds. You will get to wager casually without the need of spending a lot of money and still get the thrill and excitement that you can find on the Vegas strip. If you have been looking for a perfect way to wind down during your hectic days, look no further than this, especially if you have an affinity for betting. DoubleDown social gaming offers you the convenience of playing from the comfort of your workplace during breaks or at home. You don't even have to create an account since you can use the guest mode, which is still quite electrifying.